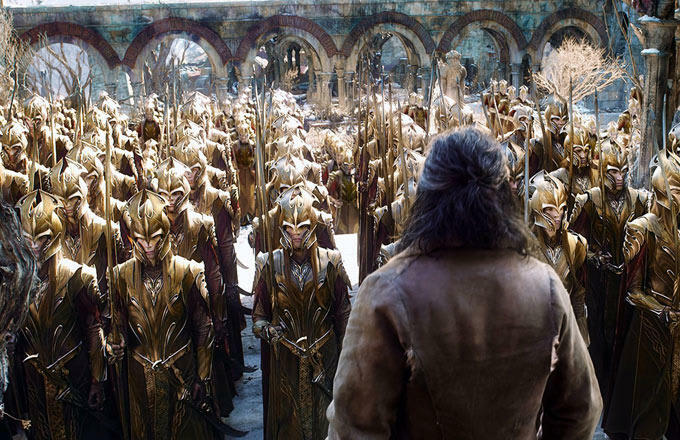 There was a lot to choose from at the movies over the post-Christmas weekend, but it was those hairy-footed guys from Middle-earth that brought in the bucks. The Hobbit: The Battle of the Five Armies brought in $41.4 million to stay in the top spot at the box office for another week, according to the studios&apos; Sunday morning numbers. The Angelina Jolie-directed Unbroken was No. 2 in its debut weekend, bringing in $31.7 million with the true story of Louis Zamperini, a bombardier who was shot down during World War II and captured by the Japanese, while Disney&apos;s Into the Woods was third with $31 million, giving it the record for biggest opening for a movie adaptation of a Broadway show. Meanwhile, The Interview opened at only about 330 independent theaters across the U.S. and made $1 million on Christmas Day alone, plus another $1.8 million over the weekend. The Tim Burton-directed Big Eyes starring Amy Adams and Christoph Waltz flopped, earning only $2.97 million over the weekend despite opening on 1,307 screens. It didn&apos;t crack the top 10.